Bu çalışmanın amacı fen ve matematik öğretmen adaylarının bilimin doğasına yönelik anlayışlarını ve bu anlayışlarla öğrenim gördükleri alanlar arasında bir ilişkinin bulunup bulunmadığını irdelemektir. Buna yönelik olarak, “bilimin doğası anlayışları testi” hem fen hem de eğitim fakültelerinin kimya, fizik, biyoloji ve matematik bölümlerinin son sınıflarında öğrenim gören toplam 220 öğretmen adayına uygulanmıştır. Test sonuçları, bilimin doğasının yedi boyutu dikkate alınarak geliştirilen kodlama sistemine göre betimsel olarak analiz edilmiştir. Öğretmen adaylarının anlayışları ile öğrenim gördükleri alanlar arasındaki ilişkiyi incelemek için Ki-kare testi kullanılmıştır. Bilimsel bilginin nesnel doğası ve bilimde hayal gücü ve yaratıcılık boyutları hariç, öğretmen adaylarının yalnızca %50’sinden daha azının bilimin doğasının diğer boyutları ile ilgili olarak geçerli anlayışlara sahip oldukları tespit edilmiştir. Ayrıca, bilimin doğasının yedi boyutunun beşinde öğretmen adaylarının anlayışları ve öğrenim gördükleri alanlar arasında bir ilişki bulunduğu da görülmüştür. Çalışmada, fen eğitimi ve daha sonra yapılacak çalışmalara yönelik çeşitli önerilerde bulunulmuştur. The aim of this study was to investigate pre-service science and mathematics teachers’ views of the nature of science and to find out any relationships between their views and their study subjects. For this aim the Views on the Nature of Science (VNOS) questionnaire was administered to 220 pre-service science and mathematics teachers from departments of chemistry, physics, biology and mathematics in both Faculty of Education and Faculty of Science. The participants’ responses to VNOS questionnaire were analyzed by employing a coding theme based on seven aspects of the nature of science. Chi-Square test was implemented to analyze data to check the relationship between the pre-service teachers’ views of NOS and their study subjects. It was found that less than 50% of the participants’ views of certain aspects of NOS are considered as “informed,” except subjectivity nature of scientific knowledge and role of creativity and imagination in science. A relationship was found between the participants’ views of NOS and their study subjects for five out of seven aspects of NOS. Implications for science teacher education and for future studies are discussed. AAAS, American Association for the Advancement of Science. (1993). Benchmarks for science literacy: American Association for the Advancement of Science. Oxford University Press New York NY. Abd-El-Khalick, F., Bell, Randy L., & Lederman, N. G. (1998). The nature of science and instructi- onal practice: Making the unnatural natural. Science Education, 82(4), 417-436. Abd-El-Khalick, F., & Lederman, N. G. (2000). Improving science teachers’ conceptions of nature of science: a critical review of the literature. International Journal of Science Education, 22(7), 665-701. Abell, S. K., & Smith, D. C. (1994). What Is Science - Preservice Elementary Teachers Conceptions of the Nature of Science. International Journal of Science Education, 16(4), 475-487. Aikenhead, G. S, Fleming, R. W, & Ryan, A. G. (1987). High‐school graduates’ beliefs about science‐ technology‐society. I. methods and issues in monitoring student views. Science Education, 71(2), 145-161. Ainley, M, & Ainley, J. (2011). Student engagement with science in early adolescence: The contri- bution of enjoyment to students’ continuing interest in learning about science. Contemporary Educational Psychology, 36(1), 4-12. Akerson, V. L., Hanson, D. L., & Cullen, T. A. (2007). The Influence of Guided Inquiry and Explicit Instruction on K-6 Teachers’ Views of Nature of Science. Journal of Science Teacher Educati- on, 18(5), 751-772. Alters, B. J. (1997). Nature of science: A diversity or uniformity of ideas? Journal of Research in Science Teaching, 34(10), 1105-1108. Bell, R. L., Lederman, N. G., & Abd-El-Khalick, F. (2000). Developing and acting upon one’s conception of the nature of science: A follow-up study. Journal of Research in Science Teaching, 37(6), 563-581. Brickhouse, N. W. (1990). Teachers Beliefs About the Nature of Science and Their Relationship to Classroom Practice. Journal of Teacher Education, 41(3), 53-62. Celik, S. (2009). The influence of project based learning approach on pre-service science teachers’ conceptions of the nature of science and technology and scientific process skills. (PhD. ), Ataturk University, Erzurum. Celik, S., & Bayrakceken, S. (2006). The Effect of a “Science, Technology and Society” Course on Prospective Teachers’ Conceptions of the Nature of Science. Research in Science & Technolo- gical Education, 24(2), 255-273. Dogan, N., Cakiroglu, J., Cavus, S., Bilican, K., & Arslan, O. (2011). Developing Science Teac- hers’ Nature of Science Views: The Effect of in-Service Teacher Education Program. Hacettepe Universitesi Egitim Fakultesi Dergisi-Hacettepe University Journal of Education(40), 127-139. Driver, R., Leach, J., & PhilScot, R. M. (1996). Young People’s Images of Science: ERIC. Erdogan, Rahsan, Cakiroglu, Jale, & Tekkaya, Ceren. (2006). Investigating Turkish Pre-service sci- ence teachers’ views of the nature of science. Research on education in Africa, the Caribbean and the Middle East, 273-285. Gall, Meredith D, Gall, J, & Borg, W. (2003). Educational Research: An Introduction. Boston, MA: Pearson. Gess-Newsome, J. (2002). The Use and Impact of Explicit Instruction about the Nature of Science and Science Inquiry in an Elementary Science Methods Course. Science and Education, 11(1), 55-67. İrez, Serhat, Çakir, Mustafa, & Şeker, Hayati. (2011). Exploring Nature of Science Understandings of Turkish Pre-service Science Teachers. 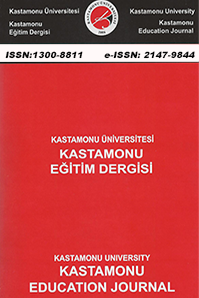 Necatibey Faculty of Education Electronic Journal of Science & Mathematics Education, 5(2). Khishfe, R., & Lederman, N. G. (2006). Teaching Nature of Science within a Controversial Topic: Integrated versus Nonintegrated. Journal of Research in Science Teaching, 43(4), 395-418. Kilic, Kerem, Sungur, Semra, Cakiroglu, Jale, & Tekkaya, Ceren. (2005). Ninth grade students’ understanding of the nature of scientific knowledge. Hacettepe University Egitim Fakultesi Dergisi, 28, 127-133. Lederman, N. G. (1992). Students and Teachers Conceptions of the Nature of Science - a Review of the Research. Journal of Research in Science Teaching, 29(4), 331-359. Lederman, N. G., Abd-El-Khalick, F., Bell, R. L., & Schwartz, R. S. (2002). Views of Nature of Science Questionnaire: Toward Valid and Meaningful Assessment of Learners’ Conceptions of Nature of Science. Journal of Research in Science Teaching, 39(6), 497-521. Macaroglu, Esra, Taşar, MF, & Cataloglu, Erdat. (1998). Turkish preservice elementary school te- achers’ beliefs about the nature of science. Paper presented at the Annual Meeting of National Association for Research in Science Teaching (NARST), San Diego, CA. McComas, W. F., Almazroa, H., & Clough, M. P. (1998). The Nature of Science in Science Educa- tion: An Introduction. Science and Education, 7(6), 511-532. McMillan, J. H, & Schumacher, S. (2009). Research in education: Pearson Education. Mellado, Vicente. (1997). Preservice Teachers’ Classroom Practice and Their Conceptions of the Nature of Science. Science and Education, 6(4), 331-354. Miles, M. B, & Huberman, A M. (1994). Qualitative data analysis: An expanded source- book: Sage. Miller, Jon D, Scott, Eugenie C, & Okamoto, Shinji. (2006). Public acceptance of evoluti- on. SCIENCE-NEW YORK THEN WASHINGTON-, 313(5788), 765. MoNE, Ministry of National Education. (2013). Updated high school physics and che- mistry curriculums. Ministry of National Education Retrieved from http://ttkb.meb. gov.tr/www/ogretim-programlari/icerik/72. Murcia, K., & Schibeci, R. (1999). Primary Student Teachers’ Conceptions of the Nature of Science. International Journal of Science Education, 21(11), 1123-1140. NRC, National Research Council. (1996). National science education standards. (0309053269). National Academy Press. NSF, National Science Foundation. (1983). Educating Americans for the Twenty First Century: Report of the National Science Board Commission on Pre-college Education in Mathematics, Science and Technology. Washington, DC. Palmquist, B. C., & Finley, F. N. (1997). Preservice teachers’ views of the nature of sci- ence during a postbaccalaureate science teaching program. Journal of Research in Science Teaching, 34(6), 595-615. Renninger, K., & Hidi, S. (2002). Student interest and achievement: Developmental issu- es raised by a case study. Rudge, D. W., & Howe, E. M. (2009). An Explicit and Reflective Approach to the Use of History to Promote Understanding of the Nature of Science. Science & Education, 18(5), 561-580. Ryder, J., Leach, J., & Driver, R. (1999). Undergraduate science students’ images of sci- ence. Journal of Research in Science Teaching, 36(2), 201-219. Sarkar, Md Mahbub Alam, & Gomes, Jui Judith. (2010). Science Teachers’ Conceptions of Nature of Science: The Case of Bangladesh. Asia-Pacific Forum on Science Lear- ning and Teaching, 11(1). Schwartz, R. S., & Lederman, N. G. (2008). What Scientists Say: Scientists’ Views of Nature of Science and Relation to Science Context. International Journal of Science Education, 30(6), 727-771. Taşar, M. F. (2003). Teaching history and the nature of science in science teacher educati- on programs. Pamukkale Üniversitesi Eğitim Fakültesi Dergisi, 1(13), 30-42. Türkmen, L. (2008). Sınıf öğretmenliği programında öğrenim gören birinci sınıf düzeyin- den dördüncü sınıf düzeyine gelen öğretmen adaylarının fen bilimlerine ve öğretimine yönelik tutumları. Kastamonu Eğitim Dergisi, 16(1), 91-106. Urhahne, D., Kremer, K., & Mayer, J. (2011). Conceptions of the Nature of Science--Are They General or Context Specific? International Journal of Science and Mathematics Education, 9(3), 707-730. Wyss, V. L., Heulskamp, D., & Siebert, C. J. (2008). Increasing middle school student interest in STEM careers with videos of scientists. International Journal of Environ- mental & Science Education, 3(3). Yildirim, A, & Simsek, H. (2005). Qualitative Research Methods in Social Sciences. An- kara: Seckin Yayınevi. ISNAD ÇELİK, Suat , KARATAŞ, Faik Özgür . "Öğretmen Adaylarının Bilimin Doğasına Yönelik Anlayışları İle Öğrenim Gördükleri Alanlar Arasındaki İlişki". Kastamonu Eğitim Dergisi 23 / 2 (May 2015): 755-772.